Miguel Arias, proud dad, entrepreneur, and angel investor, has over 15 years of experience in building technology-based startups with a global reach. 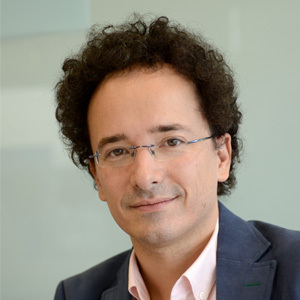 As Global Entrepreneurship Director at Telefónica he is responsible for the group relations with venture ecosystems, focused on the search of technologies and innovative solutions that complement internal research and in relation to venture ecosystems around the world. Previously COO at CARTO, he led the sales, financial and operations teams at the Madrid, DC, NY and London offices, directing the company’s growth and scaling up. He co-founded IMASTE, the leader webcast virtual platform in Europe until its acquisition in June 2012 by ON24, Inc, a multinational company based in Silicon Valley. After the acquisition he was responsible of the integration process between ON24 and IMASTE in charge of the business in Europe. Trying to enhance the local entrepreneurial ecosystem, he co-founded and presides over Chamberi Valley, the main Madrid-based networking initiative for startups with over 1 million € revenue or 1 million € in investment. He loves to teach and share experiences as entrepreneurship professor for startups at the IE Business School, ISDI, and Seedrocket.